<="" p="" />A very winter-hardy hybrid buckeye selected in northwestern Minnesota. Introduced by North Dakota State University in collaboration with Bergeson Nursery, Fertile, MN. Parentage is unknown. In NDSU trials, it grew faster than most buckeye accessions for the first 10 - 15 years. 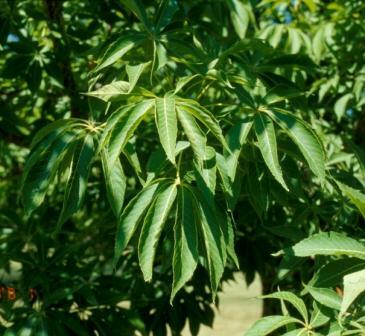 This cultivar is far superior in quality to most seedlings of Ohio Buckeye - Aesculus glabra. Dense, globose form. With age it broadens, becoming more mushroom-shaped. Summer: Emerging light green in spring and turning dark green in summer, typical 7 palmately compound leaflets. Autumn: Brilliant orange-red fall color. Medium-Course in leaf, Course in winter. Yellow-green 4-7” long panicles in early to mid May. Spiny golf ball sized capsules. Attracts wildlife, especially squirrels. Moist well-drained soils, soil pH adaptable. Grafting (including budding) and softwood cuttings. High quality foliage which inclines downward in an umbrella-like fashion. This characteristic lends a tropical touch to the tree’s appearance. Consistent brilliant fall color sets this selection apart from the species, which is notoriously inconsistent ranging from green to maroon. Prairie Torch® Hybrid Buckeye is a dense deciduous tree with a slightly weeping globose form. It is recommended as a boulevard, small shade or landscape specimen tree. Buckeyes are drought sensitive and prone to leaf scorch during hot, dry weather. Provide adequate water during these times. Adding 3-4” layer of mulch is recommended. Prairie Torch® Hybrid Buckeye has shown resistance to leaf scorch.